A short upper free-fall turns and cascades down a steep rock face, then twists and cascades its way down in several sections before spilling out in a small pool/rocky area at the base. It's a pretty neat falls, and it's fairly high - but unfortunately it's hard to see all of it from one point. The best view is from the base. 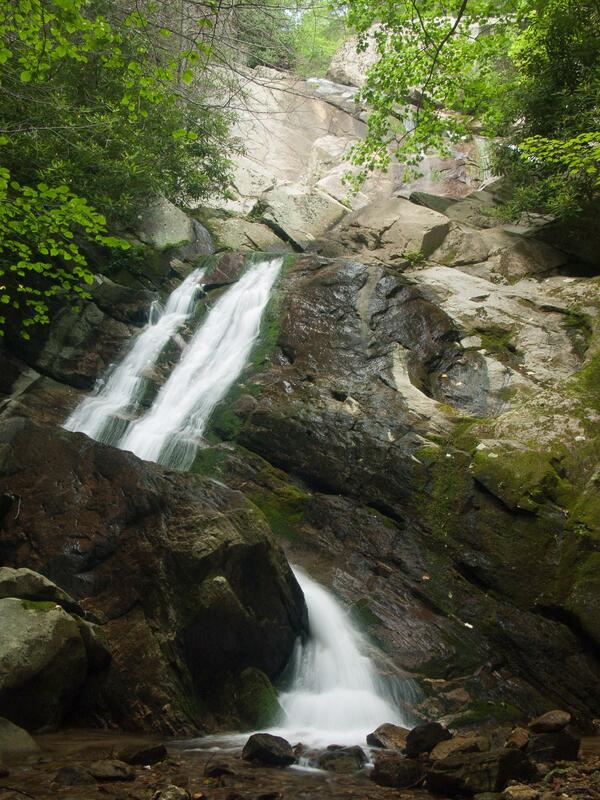 The hike to the falls is about 3.1 miles round trip, and includes Glen Burney Falls on the way. It's not really small-kid friendly and it's surprisingly steep on the way back up, but it's great exercise! This is a pleasant hike once you get past the first 1/4 mile or so, and you'll pass Glen Burney Falls and The Cascades on the way, so you get 3 in 1 hike. The trail gets back down to creek level here and starts following it downstream. Shortly, you'll cross the creek again on a footbridge. The trail continues downhill, with some steep drop-offs on the right in a few spots. Some large, dead hemlocks still stand in the woods, and there are no more houses the rest of the way. Continue downhill a short ways. A side path to the right leads about 100 feet to an observation deck with rails at the top of Glen Burney Falls. Continue down the Glen Burney trail and around another switchback. The trail reaches a T intersection; to the right is the base of Glen Burney falls. Continue down the Glen Burney trail toward Glen Marie Falls. The waterfall will appear on your right; the trail switchbacks down from the top. (Be careful of the wire trip ropes - I mean safety ropes - strung across the top of the falls about ankle high, waiting to send you over the edge if you aren't looking!) At the middle switchback, you can get a glimpse over a rock bluff of the upper portion of the falls - which is easier to see when the leaves are off. From the base, you get a good view of the two lowermost cascades, but not as good a view of the top.